We all need to indulge ourselves in some extracurricular activities such as learning to play a musical instrument. Although you can learn to play different types of instruments but of this guitar is a good choice. It will help you to have fun and relax, increase your social interaction skills, help you know more about culture and history, make you more creative, improve your self-expression and more. The art to read the sheet music and play the chords will pave the way for new neural pathways. A guitarist essentially will rewire his brain in a positive way that will result in different kinds of cognitive perks. The perks of taking guitar lessons can be divided into 5 areas namely physical, mental, professional, personal and social. 1. Physical Benefits- When you learn to play the guitar it will work wonders for your physical health. It will help in strengthening your wrists and hands through practicing strumming and chords regularly. Playing the guitar will also help you to burn your calories by performing and standing onstage. As per a study playing the guitar at times of stress and anxiety can make a person feel better. Besides, it will also help to lower blood pressure. Playing the guitar can act as a painkiller. That is because music can be absorbing. 2. Emotional and Mental Benefits- Playing the guitar can help to improve one's motor skills, intelligence and focus. Apart from the cognitive changes in learning how to play the guitar can offer you with an array of emotional and health benefits. 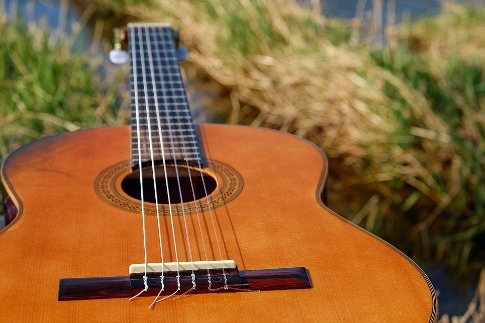 Playing the guitar can be highly therapeutic and can have a significant impact when it comes to stress levels. After a hectic day in office one can return home and play the guitar for some time to release all the tension and for those who are passionate about music can unleash the inner rock star by playing the guitar. It is the guitar that demands one’s complete attention and will help him/her in completely switching off from the world outside. Playing the guitar will provide you with a sense of accomplishment resulting in self-growth and great happiness. Most people these days are trying to create a balance between their work life and creativity. Music is a highly creative outlet which will provide them with much joy. Playing the guitar can give you with that sense of nostalgia/euphoria. To perform a song with uplifting lyrics of happier times will elevate the mood instantly. Lastly, it will provide empowerment and hope to other people via portraying one's talent in front of the public. If you are interested in taking guitar lessons, visit https://trustyguitar.com/. 3. Professional Benefits- Yes you heard it right. Taking guitar lessons can also offer professional benefits. It can result in a can-do attitude when it comes to handling a challenging task at the office. When one masters a problematic song during the weekend filling the spreadsheets can be simple. The act to learn how to play the guitar will help in settling a schedule. Practicing it just 15 minutes every day can offer significant outcomes. One can eventually apply this to other facets of work and personal life to help with both own discipline and time management. When a person regularly practices chords and guitar scales it will help them to improve their English and Mathematics skills. Although this may sound weird initially but it helps. Though subtle, one can improve his/her math while strumming their guitar lazily. And when it comes to English skills, kids that learn a musical instrument such as a guitar at a tender age can develop a better reading comprehension compared to their peers. 4. Personal Benefits- The right passion and the right guitar lessons can take one to an entirely new level. From being a tentative player that plays classics in the bedroom one can turn into a real musician by creating their riffs. But the truth is it is much beyond this. It will help one in becoming a well-rounded individual. When it comes to personal development, there are a lot of benefits to playing the guitar. It will improve one's memory and concentration via learning to create chord shapes and reading the guitar tabs. The parts of the brain that is responsible for memory gets stimulated when one plays the guitar. It relates to muscle and cognitive memory. Kids with ADHD are often told to play the guitar to focus the energy on something positive and creative. Improved discipline and drive will work wonders in helping one to develop concentration and focus on a new skill. The hobby to play guitar will help to boost up one's memory. Most importantly it will help one to handle multiple tasks by augmenting their listening skills, sight-reading, and guitar hand coordination. At the time of practice, the guitarist along with developing their musicianship can also multi-task such as read guitar scores and TABS, create the perfect chord shape through their hands, focus on playing the notes accurately, reading ahead for all the upcoming notes, keep time and listen to the music being made. Besides, it will boost up one's confidence and help them attain fulfillment via creating new goals like mastering any guitar song. 5. Social Benefits- It is the guitar which will help in bringing people together like a group and connect through music. Socially, a guitarist will be able to enjoy a couple of perks. Firstly, he or shecan raise the mood via playing the instrument in a room full of people. With regards to uniting people, nothing can equal a guitar as it possesses that sense of spontaneity. A guitarist can help in bringing new people into a world via unveiling his hidden talent. The biggest perk to take a guitar lesson and learning how to play the guitar is it will last forever. Playing the guitar is more than merely a hobby. It becomes a fraction of who one is and develop a vital link in the best relationships they will have. The bottom line is enrolling in a good guitar class and making the most of it.